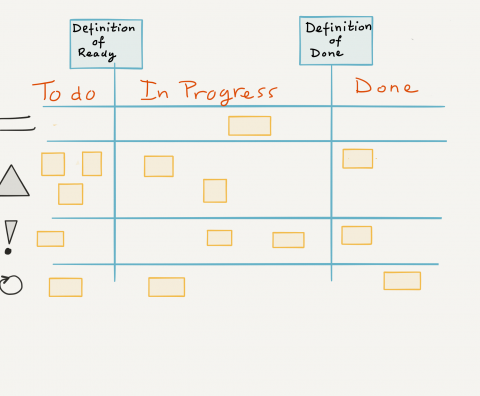 Here, the team has a backlog consisting of features to support the business, a visual board with three lanes, “definition of ready,” “definition of done,” and a cadence of two- or sometimes three-week sprints. Note: the “definition of ready” is not part of Scrum, and a good practice often used by Scrum teams. See also this blog. The work follows the pattern described by Serge Beaumont in this presentation with the addition of “business requests” (requests for information). Pressure to deliver for certain groups of business users will be at the cost of other stakeholders. The challenge for the team is balancing between having predictable lead times for new features, work that requires immediate attention, and acceptable lead times on business requests. Expedite: Reserved for work that needs to be dealt with immediately, e.g., production incidents. Sometimes also called “Fast Lane.” Maximum of one work item at all times. Operational: Meant for all tasks that are needed to keep the application up and running. Typically, routine daily tasks. Note: Essential to making this working is to agree upon work in progress (WIP ) limits and to set criteria when work is allowed to enter the lanes, as described in the section below. Note: As mentioned above, this follows the pattern described in the presentation with the row for “Urgent” work added. As explained in the presentation the “definition of ready” and the “definition of done” guard the quality of work that enters and leaves the team respectively. Note: One other type of item is usually allowed in this lane: those that have a deadline and are late for delivery–and have a policy in place! Regular request for new features and enhancements. Predictability is most important. Some variation of the lead time is considered acceptable. Service level is … weeks with 85% on-time delivery (one standard deviation service level). Business requests. Typical use includes requests for support, the creation of reports or information (e.g., national banks may require reports as part of an audit). Also, other types of requests that are not critically important enough to go into the expedite lane, and are more than a couple of hours of work. For these, lead times are expected but are considerably shorter than those lead times needed for changes. Maximum of … hours per day by the team. It’s important to limit the amount of time spent on these items by the team so the team can maintain the expected service levels on the other types of work. From all the work item types mentioned above, only the “change” item is plannable. “Run” items are very ad hoc by nature, as is the case with “operational” tasks (some are routine and some just pop-up during the day). Requests from the business tend to come in on short notice with the expectation of short delivery times. Because of the “ad hoc” nature for most work item types, planning and scheduling must be done more often than once every sprint. Replenishment of the “to do” will be done continuously for the rows whenever new work arrives. The team can agree on a policy for how often and how they want to do this. 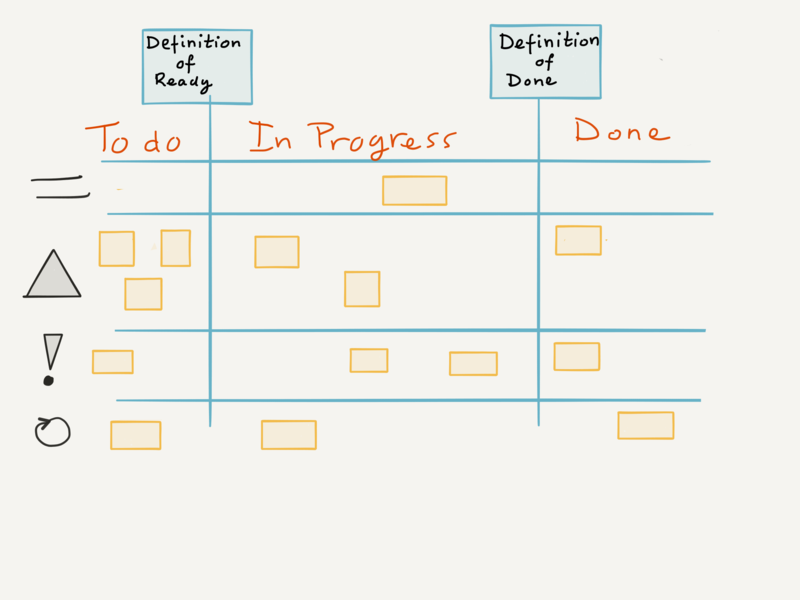 The sequence of scheduling work between the rows is done either by the product owner or self-regulated by a policy that includes setting WIP limits over the rows. It will effectively divide the team’s available capacity between the work item types. Business support teams follow a pattern very similar to that described in the presentation. 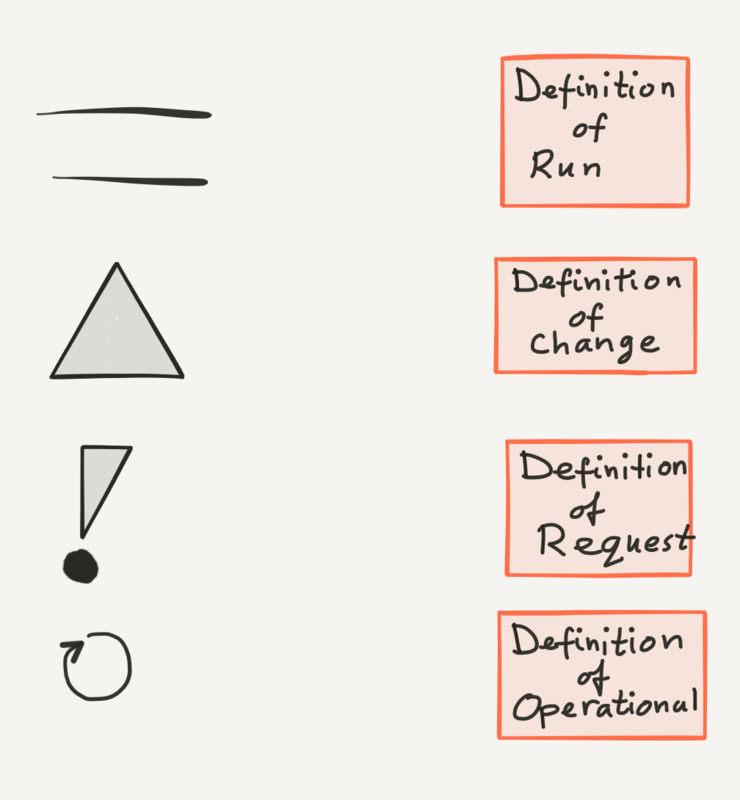 In addition to the “run,” “change,” and “operational” types of work, the type “request” is identified. The work is not described by a single backlog of similar work items but rather as a backlog of types of work. The way teams handle these types is different because each has a different risk profile (class of service). Allowing for a more significant variation on the “change” items allows for a higher service on the “request” items. Thanks for describing this pattern! One thing that’s not clear to me is to what extent the existence of such a team is simply the result of the failure to manage a backlog properly. After all, the concept of “action this day” meteorites exists in Scrum, too. Or is this pattern to be regarded as an admission that, in the “real world”, there are so many meteorites that one effectively needs to have a dedicated “action this day” team to allow the “other” team to get on with the more medium-term activity of delivering on planned features? If so, what does one do when the “action this day” team is not fully utilized, unless we’re assuming that never happens? Do they augment the development team? Spin their wheels? Other? I don’t know what you mean exactly with ‘meteorites’ and assume you refer to handling these items through a ‘fast lane’. With the separate team set-up (one dedicated team for the ad hoc stuff and another to work on planned features) you are effectively fixing capacity (1 full team) to the ‘Change’ row. In practice this is not a very flexible approach. Having one team deal with all the types of work allows for greater flexibility is picking up different types of work. Rather than trying to build teams around plannable work, have the team deal with the reality of having a mix of work items of different nature.